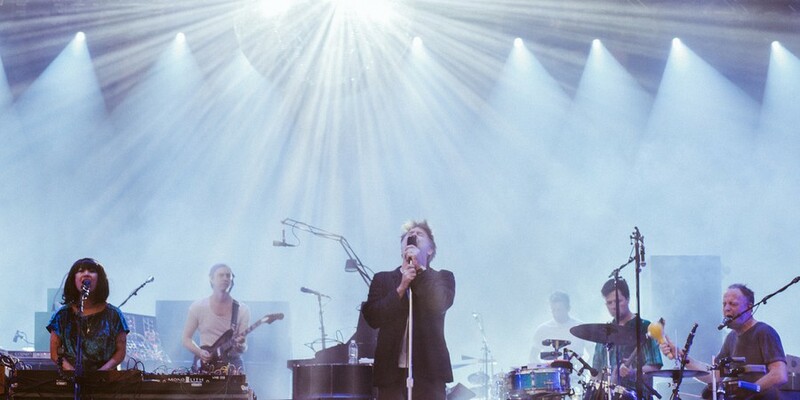 LCD Soundsystem performed at Pitchfork Music Festival on Friday, July 14, 2017. The green line came to a halt at Ashland, where a horde of grasping hands were begging for an extra ticket to buy. I could see at least one person thinking about sliding in where the barricades overlapped. I was tempted to sell my ticket and try it myself, had I not been there on a press pass. Danny Brown was playing by the time I made it past the press entrance (surprisingly, there was no bag inspection). All I could see was an ocean of older men whose cavernous bald spots reflected harsh afternoon sunlight back at me. Had I stumbled into a Bosley hair treatment conference? How did Bosley manage to book Danny Brown? 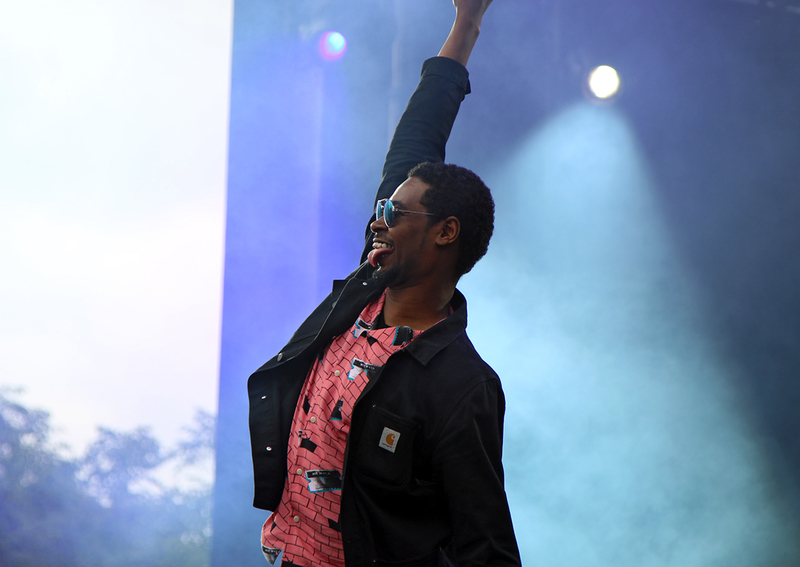 Was Danny Brown using minoxidil supplements? Only when I saw tufts of smoke emerging from dimpled hair volcanoes and inhaled the poignant stench of cannabis did it hit me—I was in the right place. A few feet in front of me, someone caught my eye. He was tall, moving in ways that should not be possible, and is best described as a cross between Joe Dirt and Fred Savage (circa 1990) dancing like his hips were bolted to his feet. He might have collapsed at any moment. I ran away to avoid responsibility. As I made my way towards the Book Fort, the mobile and interactive book fair at the festival, a man with salt-and-pepper hair and a sharp widow’s peak stopped me. He asked why I was walking around with a notepad, saying he had never seen one before. I explained and his buddies laughed. They wanted an interview. MAN 1: The lines for beer are way too long. Do you have any way of talking to Pitchfork? MAN 2: [Wearing a “Superman” tank top] Well, tell them to stop treating us like children! MAN 3: Yeah, the tickets are terrible. The lineup is great, but there are so many lines. Music is great, though. DAVID: What has been your favorite set? ALL: Oh, we just got here. MAN 1: We’ve been here about 10 minutes, but Danny Brown is killing it. Don’t you think the lines are too long? MAN 1: Yeah but the music is good! DAVID To MAN 1: Do you care if I ask how old you are? MAN 1 Solemnly: I’m 45. How old are you? DAVID: So for this interview do you just want me to write that three men in their forties complained about limited access to beer? He concluded the interview with a folksy “God bless!” I left them to their drunken revelry, nearly stepping in a crusted pile of weed vomit. Someone was coming over to clean it. God bless. I walked down the array of food tents but didn’t see the beer line they were complaining about. What I did see was some antioxidant-infused flavored water being passed out for free! Delicious. Being a nondescript medium-build white guy among nondescript medium-build white guys (as was the case at this festival) meant infinite refills (no one could tell us apart). Eventually I was spooked away by a large man whose back hair continued into his nostrils. On my way over to Dirty Projectors, I spotted a man in a neck brace wearing the same glasses that Greg “Fossilman” Raymer wore during his 2004 World Series of Poker Main Event run. I made a note to interview him. Danny Brown’s set was winding to a close when I heard “Pneumonia” being played. Across the field I could see the anxiety and paranoia set in as police lights from the stage coincided with the heavy drum kit on the song. Juxtapose this with the conga line of folks grinding into each other, filling the air with an ectoplasmic tinge of pre-jism . Everyone handles being high differently, I guess. Danny’s set was interesting. First of all, love the haircut. But there was some kind of debilitating cognitive dissonance between Danny and crowd members past the third row. He has an unmatched excitement on stage (and in the studio), but the crowd merely nodded in appreciation as if they’d been handed lukewarm coffee from Sheetz. Danny’s live performance was so heavily dependent on sustained momentum building. Was the Pitchfork crowd just too pretentiously stiff to move? Is fun not fashionable? Maybe they were just hungry? I got the impression that people enjoyed the music with their head and not their heart. Move a little! From the front of the Dirty Projectors stage, I got a better look at Danny Brown’s stage. There was a certain thermodynamic quality about the crowd. When someone becomes more intoxicated they tend towards the area of less aggregate intoxication. It spreads the sloshiness evenly across the group. Dirty Projectors was alright, and I loved the varied instrumentation in their set. Its sound carried throughout the Park pretty well. But the set was plagued by an overly sentimental attachment to creating an “intimate” setting, which got tiring pretty quickly. David Longstreth should keep the beard but ditch this persona of the sagely artist. It felt performative. He would alternate between minutes of passionately closing his eyes and long periods of eye contact. I loved the music, but the venue wasn’t set up for the vibes intended by Longstreth. After a humorous conversation with the guy in a neck brace (there was a shallow pool and an ex-girlfriend involved) I squeezed my way into the crowd for LCD Soundsystem, the night’s headliner, annoying many along the way. I slid like a snake in and around various couples struggling to hide erections. Eventually, I gave up on getting to the front. What was the point of that three-hour breakup concert y’all had not so long ago? Just as a point of courtesy, please try not to invent another model for artists to sap every penny they can from their dedicated fans. If a band separates, “they’re just doing that ‘LCD thing’” now. It’s hard to know who to trust. I’ve never been a huge fan of the alternative rock ballad format. If done wrong, it can be self-indulgent and masturbatory. Big fan of your stuff, though! This set was interesting. I was impressed with the persistent wood block feature. It had a surprising register and texture. But how was I able to hear it? It couldn’t have been amped right? I enjoyed the overall balance and range of what y’all played, but I have one major grievance: the synth was unbearable! It was 1) too loud, 2) screechy and penetrating and 3) sounded like a chainsaw! While not my cup of tea, I can usually tune that type of synthsaw mix out, but this was particularly offensive. It would have been a perfect match had Leatherface been on stage, not a rock band. I would also like to apologize for the crowd’s strange cacophonous clapping. I think we were trying to clap to the beat? Also, we get that you’re old! You don’t have to remind us. Your dancing does that well enough. Overall, your set hit high peaks without ever sinking too low. The energy was just right. The church just beyond the fence and the ominous rain clouds looming above set a unique (if sometimes incongruous) mood. This was the first set that made me put away my notepad and start dancing. My body felt compelled to move and everyone around me followed suit. The sonic space was variable, pushing me left to right, back and forth. It achieved what great sound art does: it recalled a simpler, antecedent instinct to convert what I heard into bodily movement. I didn’t feel like I was listening to the studio album. This live performance hit the perfect balance between personalized experience and fidelity to the recording. I had a great time.